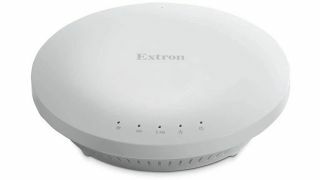 The What: Extron Electronics has launched WAP 100AC Wireless Access Point. The WAP 100AC is a ceiling mounted dual-band wireless access point engineered for heavy network traffic and demanding business environments. The What Else: The WAP 100AC supports the latest wireless technologies, including dual-band frequency operation with band steering, high-transmit power, enhanced receive sensitivity MIMO, and four internal high-gain antennas that all help maximize network performance and expand device network connectivity. "Over the last few years, the Extron Control app has brought the convenience of BYOD room control to thousands of applications, worldwide," said Casey Hall, vice president of sales and marketing for Extron. "The introduction of our WAP 100AC is timed perfectly with the latest version of Extron Control, which includes support for Android devices in addition to the existing Apple iPad support. There are now more ways than ever to control your AV from the palm of your hand." The Bottom Line: In addition, the WAP 100AC helps streamline integration with the latest PoE+ standards. PoE+ allows the access point to receive power and communication over a single Ethernet cable. The WAP 100AC is ideal for use with the Extron Control app. The WAP 100AC comes in both a U.S. and an E.U. version.